"A popular horror indie game that will definitely give you nightmares." By now, everyone that is a gamer has heard of Five Nights at Freddy's. Why? Not because it is competitive, but because it is very scary and very challenging to play. 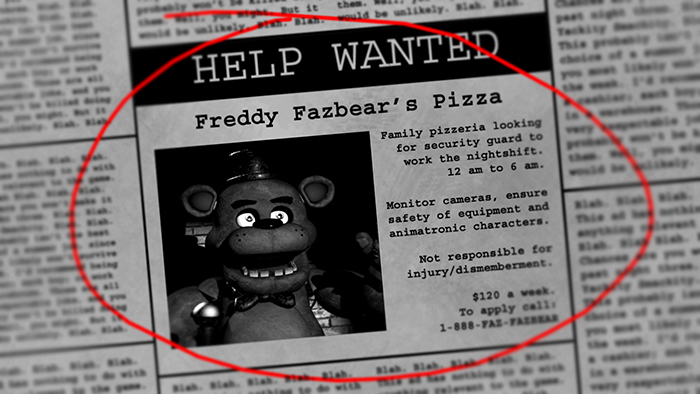 A point and click survival horror game, you must survive five nights working at Freddy Fazbear's Pizza as a night security guard keeping watch over the place while it is closed. However, it's not as easy as the job sounds - the animatronics cannot be turned off and wander the restaurant at night. Seeing as though you are the only human in the place, the robots mistaken you as a blank exoskeleton and, if they are able to get to you, will force your body into a animatronic outer-body - which ultimately kills you. Sounds pretty gruesome, doesn't it? Luckily, if they get you, you don't actually get to watch yourself die. That would be pretty brutal. You must conserve power while checking the security cameras of the restaurant to make sure that the robots do not come into your office. You do this by turning on lights and closing your office doors. Checking your security cameras, turning off lights, and closing the office doors all use some power while they are in use. If you don't want out, the power will drain fast and you will lose power. Losing power loses all control of the doors, lights, and the place turns blank - inevitably resulting in your death with absolutely no defense. There is a phone call at the beginning of your first day that explains the backstory of the game and how to play - calling is the previous security guard giving you tips on how to play Five Nights at Freddy's. The game is pretty simple, so you'll most likely figure out how to play by the end of the first day. 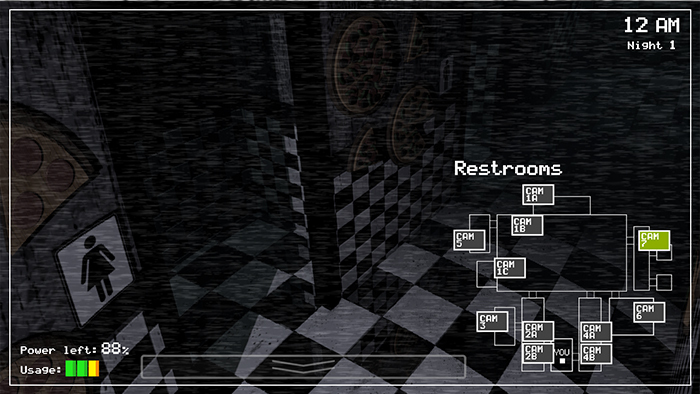 When you try this Five Nights at Freddy's demo, you will notice many different ways you can survive in the game. The most important thing to keep in mind as you are playing the game is to make sure that you do not waste any power at all. You must try at the best of your ability to not waste the power by checking the security cameras making sure that the robots do not come in and kill you. 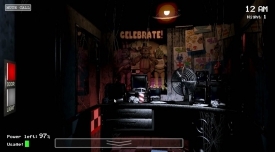 In FNAF, this is probably the most difficult part of the game - making sure your efficiency in when checking the cameras, using the electric by opening and closing the office doors, and using the electric by turning the light on and off to see if the robots are just outside your office when the doors are open. The balance of checking if the robots are near for your safety and using the electricity is the main point in the game to make sure you survive and there are many different ways you can make sure that you do not use electricity unnecessarily. If you cannot get the hang of the FNAF game on your own, there are many different guides online that have been made by people that have mastered the game that will give you advice on how to beat the game and manage the electricity while checking for the robots. These are probably the most reliable way of making sure that you are playing the game how it should be played and the best way to getting yourself close enough to beating the game. Personally, when I played the game, I cannot seem to survive for more than a couple days. The difficulty rises substantially day by day, and the electricity becomes more and more unforgiving as the days go on. Not just that, but it seems that the electricity is less "charged" day by day as well, which means you have less power to go on when checking for the robots on the regular basis. This means you will have to check for them less, and start anticipating their next move rather than checking to be sure from there on out. This is just something you will have to keep playing the game to figure out. However, the guides do a good job at teaching you when you should start anticipating the robots to pop up and scare you before they come into the room. When you start to anticipate the robots, then from there on out you will just have to learn how to manage the power so you can survive each night. This becomes harder and harder each and every night because there is less power available as the nights go on. It seems the story behind this is that the day staff forget to charge the power before the night. Which, this is bad news for you because, while in the day the staff do not have to worry about dying, the reality is not not the same for you. While they are not aware of it, you are aware that the point of your job is to watch the place, and to fend for your own survival while the robots roam about the restaurant at night. So, you must start to master the skill of power efficiency in this 5 Nights at Freddy's demo free play, day by day. Five Night's at Freddy's has continued to get more and more popular as time goes on. It was a huge hit right after it's release and got a lot of attention, particularly by YouTube entertainers and Twitch streamers - since the game was well known for being a thriller, and the reactions of those who were currently playing the game are pretty funny to watch since the robots jump out at you. A lot of the community behind the game continued to grow in popularity so substantially that the developer did not hesitate when it comes to working on a sequel to the game, which - in the story of the game is actually a prequel, but that is besides the point. Both of the games have gained a lot of attention, the second way was probably regarded as just as good as the first release, if not better. You will experience this when you play this Five Nights at Freddy's download. Having mentioned the online community that promoted the Five Nights at Freddy's game, just because of it's jump thriller type gameplay, the game can also be pretty fun to play with your friends. You can witness just how they react to the game and all of the surprising thrills the robots cause when they are working hard to get into your office. In fact, the game can be a fun game to play with your family, unless some people in your family would get scared of the robots - this would probably be younger children. I know it was definitely fun watching my friends play the game - especially when it hit the consoles and we were able to play the game in the living room rather than on the computer. As of this moment, the 5 Nights at Freddy's game is on the third release and, while not as hyped as it was before, is just as fun as the first two releases of the game. While it is a relatively simple game to play (while difficult to beat), there is actually a pretty fun storyline behind the game that each of the releases have followed by. This is always interesting when the games are made so simple, and are so much fun to play. And, to continue the story and the jump thrill fun, there is a fourth release planned to be released very soon which is planned to deliver the same fun gameplay and thrills as its predecessors. In just one years time, since the first release of Five Nights as Freddy's, the game is going on its fourth release. This is probably a bit faster, however in its defense the game has always been relatively simple and, if you know how to play the game, can be beaten in just a few hours. So, in this case it might be acceptable that the games have been releases so fast. Not just that, but the game is also probably pretty simple and fast to develop, so I can definitely see why the developer has been so keen on releasing the games so fast. 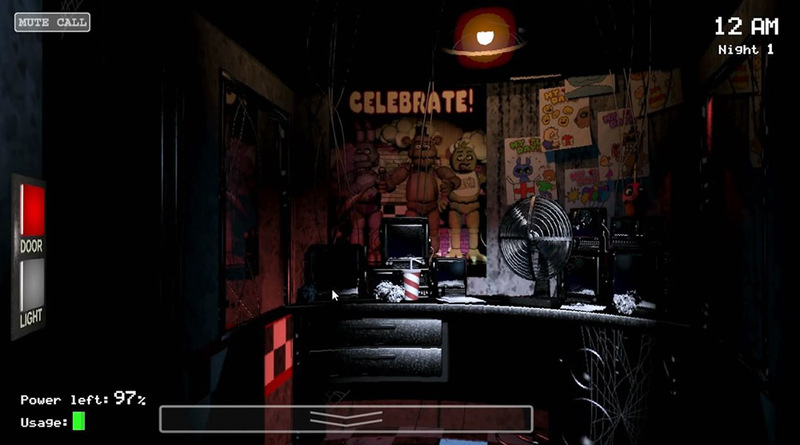 This will also make sure that you do not forget about the game and that something else does not take your attention that might pull you away from the thrills you enjoy when you play Five Nights at Freddy's 1. All in all, the game, since its first release, is extremely fun to play and fun to watch others play, as well. It is definitely recommended to try if you have not done so already. Even if you are not too fond of scary movies and games, I think its worth giving this one a shot since it is such a simple game - and if you do not like it you simply do not play it again. Though, even people that do not normally like games like these have found that Five Nights at Freddy's is pretty fun and worth every minute of the time to play. Not only that, but it is pretty challenging! 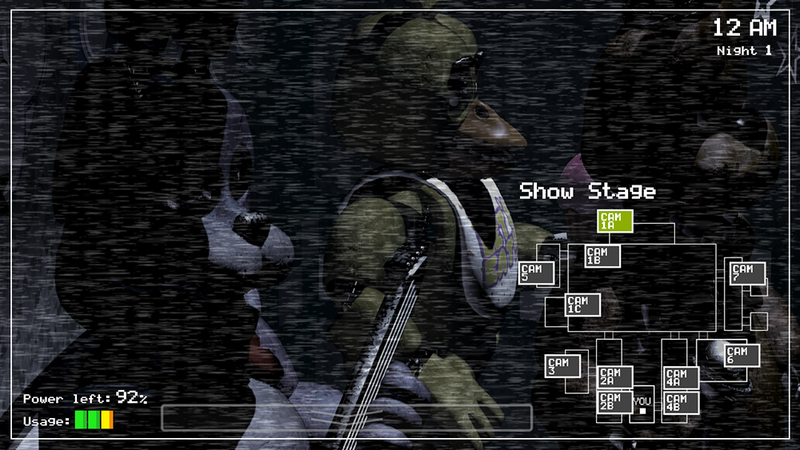 You can experience all of that in this Five Nights at Freddy's free download. Want to see what everyone has been talking about? 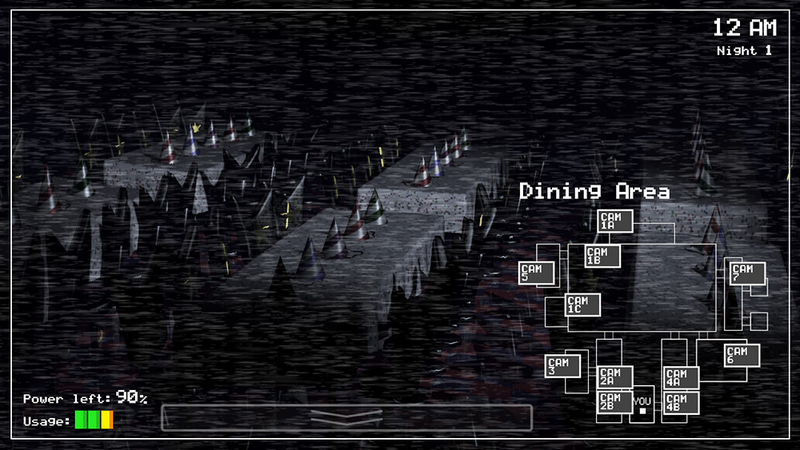 Try out this free demo of the game in this Five Nights at Freddy's download.